Fixing a bleeding ear tip…. The evidence was on the patio, big fat splashes of bright red blood. Chester had gotten too close to my mum’s back door and her collie, Vam, in typical collie fashion had nipped the end of his ear. In itself not a serious injury but with less than two weeks before we travel to Crufts it could be problematic. Everyone knows just how difficult ear tip injuries can be to heal up….for something so small and superficial they take forever to stop bleeding. And it bled for hours….. I tried everything from vaseline, deodarant, cotton wool, applying direct pressure and of course plain and simple bandaging but nothing stemmed that steady bright red trickle. Each time a new dressing was applied it took one head shake, the dressing would fall to the floor and my walls, windows and doors were resprayed with blood…. 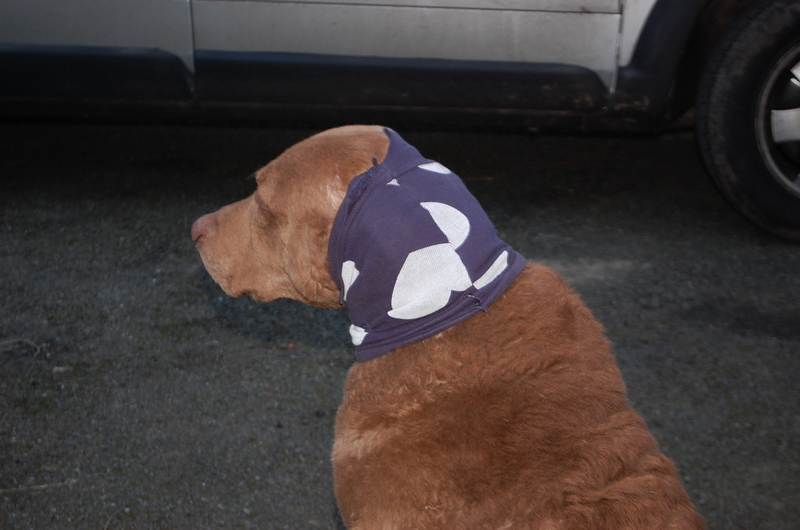 I needed to find something that would prevent his ear from moving and allow the ear tip to clot over. As a last resort I put in 2 small stitches in an aid to narrow the opening. I didn’t want to close it fully and create a haematoma but if I could slow the flow down it might clot off better. I then needed to think of a way to prevent his ears from moving. I had a light-bulb moment. Unfortunatley it involved hacking up one of my favourite sweatshirts. I cut off the sleeve and pulled it over Chester’s head. A perfect fit. The cuff was tight enough to prevent it slipping either forward or back and the sleeve was loose enough to allow air circulate around the ear but prevent movement when he head shook. It’s been on 24 hours now and I’m pleased to report that the ear tip is well on the road to healing. Another 24 hours and I hope to be able to remove his headpiece as I don’t think it will take off as a fashion statement in the gamekeepers classes at crufts just yet. This entry was tagged dogs, gundogs. Bookmark the permalink. ← Uisce….when she is good she is very, very good but….. I found it interesting that he wasn’t in the least bothered about it. When I saw him he was relaxed and making no attempt to take it off. If anything, he seemed to like it!